View of the blossoming anemones in Bitronot Be'eri, a nature reserve near Kibbutz Be'eri in the Gaza Belt area in southern Israel, February 2, 2019. 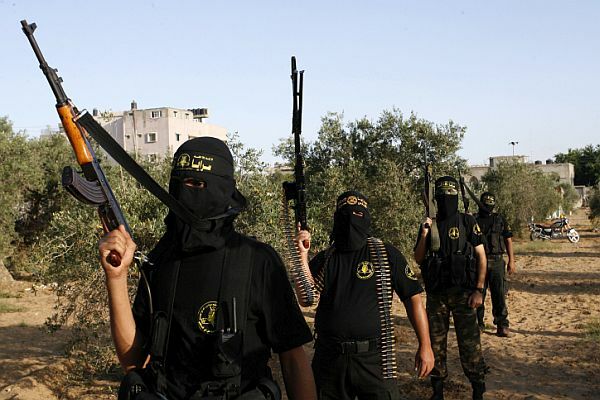 Gaza’s ruling Hamas terrorist organization planned at the start of last year to deprive Israeli Jews and visitors to the Holy Land of one of its most precious resources: its natural beauty and its nature reserves. Arson terror attacks aimed at burning it all to the ground were relentless, with daily incendiary balloons and Molotov kite attacks sent flying over the Gaza border into Israeli fields and forests to set them ablaze. In June 2018, officials placed the estimate at $1.4 million and rising, in agricultural fire damage to Israeli communities along the southern border due to Hamas arson terror attacks launched from Gaza. By August 2018, 1,000 dunams of wheat fields were destroyed in Kibbutz Nahal Oz – one-third of the wheat crop. More than 650 fires had destroyed some 2,500 acres of forest. Pine and eucalyptus planted in the 1960s, gone in a matter of moments in the Be’eri Forest – center of the annual ‘Scarlet South’ Festival, when the beautiful crimson anemones bloom after the rainy season. Among the forests damaged by the fires set by Hamas were those in Be’eri, Kissufim, Shokeda, Sderot, Nahal Hanun and those of the Besor area. 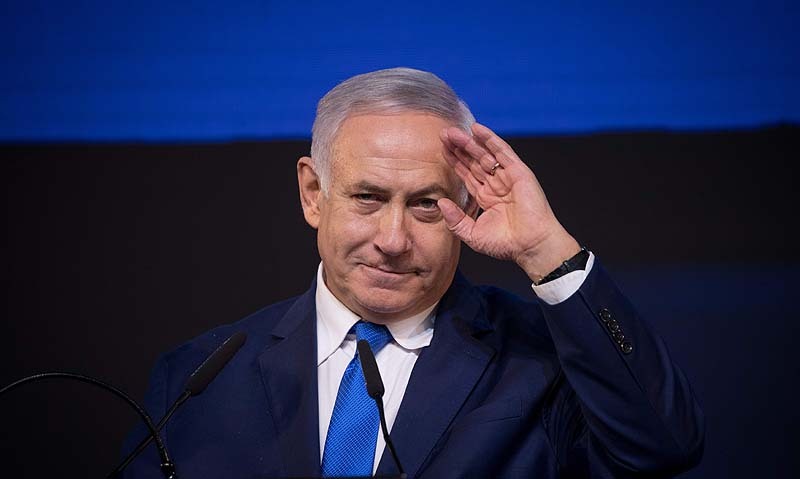 But despite the intentions of the Gaza terrorists – who destroyed more than half of the woodlands in the western Negev by the end of last summer – a greater Power has reached out to heal the land. Where the earth was scorched in a nature reserve near Kibbutz Be’eri, anemones have begun to defiantly blossom nevertheless. The fields and hills are green in southern Israel; the grass is growing high along the trails once more. 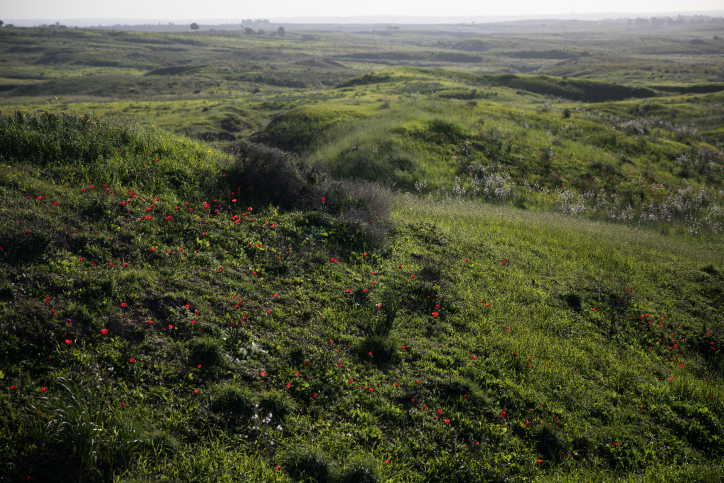 View of the blossoming fields of Bitronot Be’eri, a nature reserve near Kibbutz Be’eri in the Gaza Belt area in Southern Israel, February 2, 2019. “The damage caused to farmland and KKL-JNF forests is unprecedented,” said KKL-JNF World Chairman Danny Atar back in June 2018. That is certainly true enough; an entire year’s worth of crops was destroyed, and it will take decades before the trees can replace their years of growth. 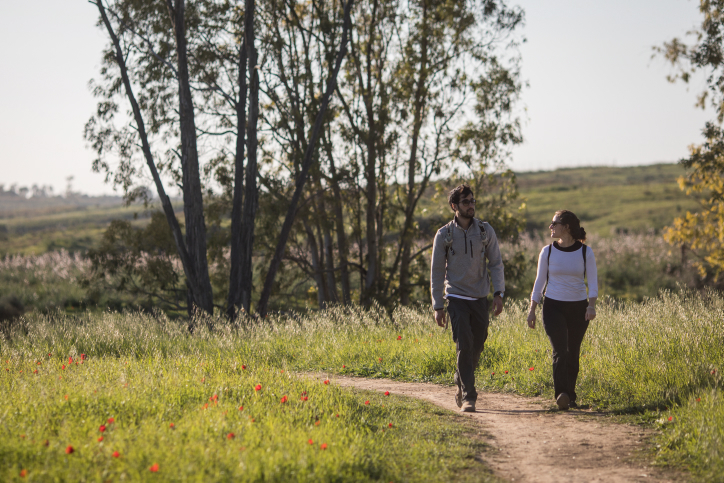 People visit the blossoming fields in Bitronot Be’eri, a nature reserve near Kibbutz Be’eri in the Gaza Belt area in southern Israel, February 2, 2019. 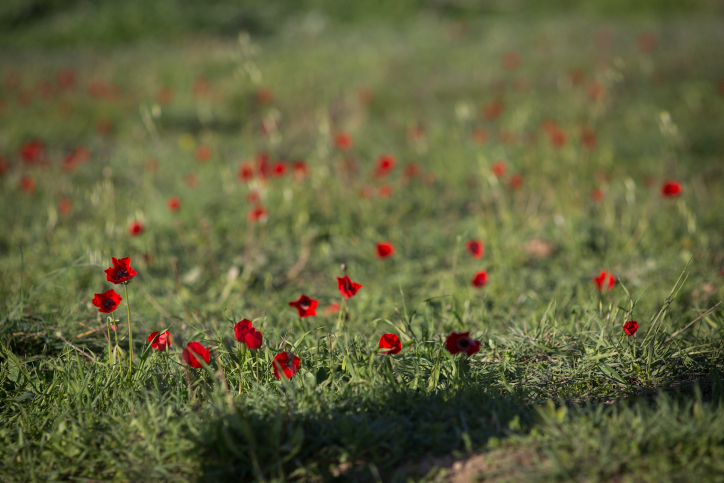 Local residents embarked on a planting campaign, and in places where terrorists chose to burn and destroy, Israelis planted new trees instead. “They burn, we plant,” was the banner under which the campaign was launched at Kibbutz Or HaNer with the help of JNF-KKL. No terrorist has ever had the power to destroy the strength of Israel.